Kids love noise. We have trash. Combine the two and kids will create music while they explore sound and rhythm. The idea for this game came from an exhibit at the Exploratorium in San Francisco. 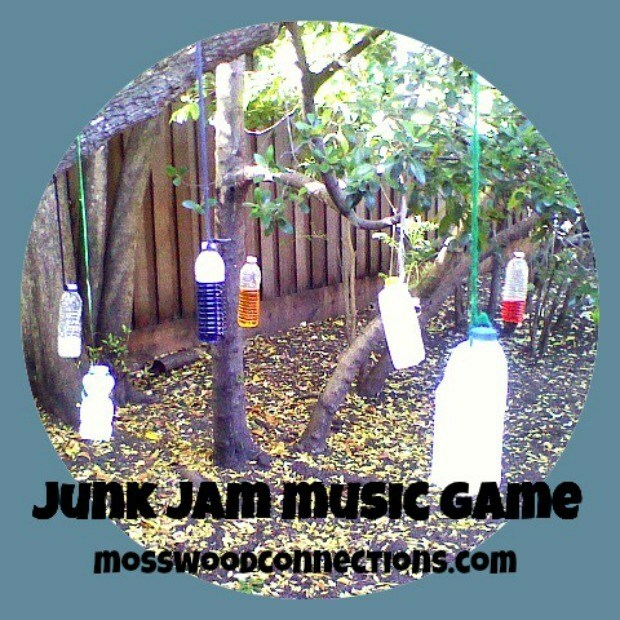 It is a simple idea: hang trash from the ceiling (or tree branches) and let the kids tap and drum to explore the different sounds. Once the bottles were hung the ideas for games just kept coming. Try this in your yard or school and see what games make your heart sing. Optional: Cotton and Tape to turn the sticks into drumsticks. Tie the string around the handle or neck of the bottles. I used glue to secure the string. Hang from hooks or branches. To make a drumstick, take a stick, put a cotton ball on one end, and wrap with tape. 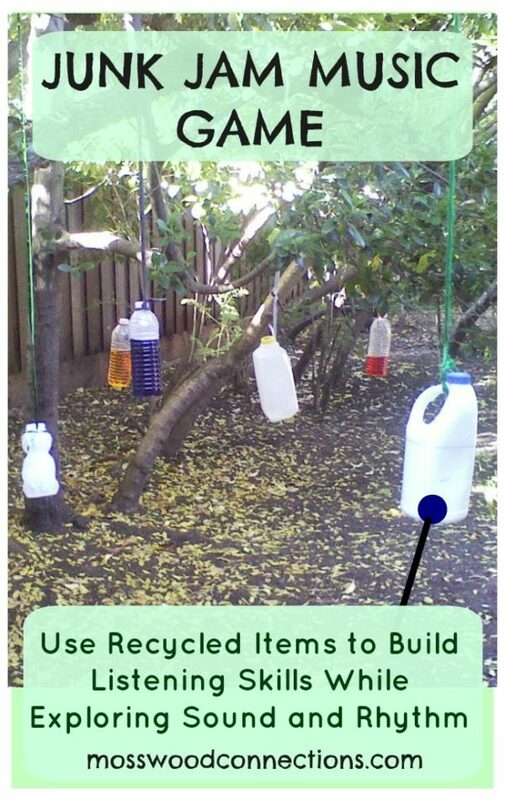 Optional: Fill some of the bottles with water and objects like rice, beans or pennies so the bottles make different sounds. Let the children explore the sounds that they can make with the bottles. Once the children have become familiar with the sounds that the different bottles make, have them close their eyes while someone hits one of the bottles. Can they guess which bottle made that sound? Play a simple rhythm, have the children copy the rhythm. Explore pitch: which bottle makes the lowest pitch? The highest? Turn it into a math game. Write numerals on the bottle. For number recognition, call out a number of a bottle for the child to drum. For simple addition add the beats of 2 bottles. CHILDREN WILL WANT TO EXPLORE SOUND AND RHYTHM WHILE THEY DANCE AND SING!